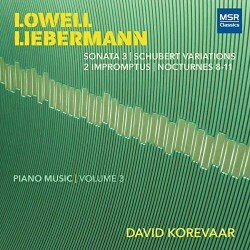 Apart from the witty Schubert Variations, much of the music on this CD devoted to American composer Lowell Liebermann is dark, but often with a compensating serenity or ethereality. It can exhibit tension and agitation as well, and rarely are there any lengthy happy moments. There isn’t lot of fast music either, but when the tempo does turn lively, seldom is the mood sprightly or spirited. Instead, busyness more often yields to solemnity, or brightness turns into disappointment. Or so it seems. But there is much flowing lyricism and much subtle beauty here, nevertheless. Reading the above description, some might decide this kind of music is too depressing or too morbid for their tastes. But I would advise that reaching that conclusion is akin to trusting a first or superficial impression. These works, all appearing here in world premiere recordings, are fairly accessible, no more difficult to grasp than most Prokofiev and Bartok piano works. Moreover, they are deftly imagined and ultimately quite rewarding, at least to the listener willing to play through them two or three times. Even just once might do. As for Liebermann’s style here, it is tonal and fairly conservative without ever sounding imitative. His teachers at Juilliard included David Diamond and Vincent Persichetti, and while Liebermann is quite different from both, I would say he is closer in spirit to Persichetti, who wrote a large body of piano music, than to Diamond. The Nocturnes presented here are the last four in Liebermann’s output, at least as I write this. Though John Field was the first major composer to write nocturnes for solo piano, it was Chopin, of course, who wrote the most famous ones and is most closely identified with the genre. I would say there is little stylistic kinship between Liebermann and Chopin, though it’s almost impossible to escape Chopin’s haunting and dominating presence altogether. That said, differences between the two are far greater than similarities. While Chopin can be dark, he is just as likely to be dreamy or serene in his nocturnes and is almost always very elegant. He usually presents a catchy, beautiful ornamented melody and rarely turns extreme in his emotional demeanor, but nevertheless freely expresses his feelings. Liebermann, on the other hand, tends to rein in emotions and show less warmth most of the time, creating moods that at times appear otherworldly. He also seems to expand and develop his ideas at somewhat greater length. The best of the nocturnes here are Nos. 8 and 11. The former is the most difficult to perform, according to the pianist here David Korevaar, who provides very informative album notes. No. 8 begins with an undulating figure in the left hand over which a lyrical but gloomy theme is played. The music vaguely—maybe more than vaguely—calls to mind the two Lugubrious Gondolas by Franz Liszt, at least initially. But where Liszt is mostly meditative and comparatively brief in his focus on watching a funeral gondola flow down Venice’s Grand Canal, Liebermann presents his darkness—whatever it is—and expands on it, works it up and storms the heights before finally settling into a quiet resolution. The Eleventh is the most colorful and extroverted of the four, moving from initial gloom to a vibrant sense of brightness, which becomes short-lived as the music reaches a scurrying, anxious manner that collapses into a swirling serenity, leading to a seeming dreamworld that can only soothe. It’s quite a journey. The other two nocturnes are also quite fine creations. The Variations on a theme of Schubert begins with a simple, child-like theme that conveys such innocence and naïveté. The theme soon takes on a drunken demeanor and moves on to many other guises, the nearly twelve-minute piece divulging humor, anxiety, playfulness, fantasy, and plenty of fun. The two Impromptus that follow are similar in mood to the Nocturnes but shorter and less varied in their expressive language. In the Sonata No. 3 we hear a whole world of expression: tension, conflict, anger, ruminating, foreboding, serenity, and possibly hope. It is a craggy, multi-faceted work, Bartokian in some of its percussive writing in the first movement. It becomes serene, gloomy and skeletal in the second movement in its often single-note expression. The ensuing panel, “Lullabye”, maintains the scaled down style and dark mood. The finale seems to wander and struggle at the outset but a brief sunlit glimpse offers hope only to lead to more tension and then disappointment. Does the brief rush at the end show ambivalence, hope? This nearly eighteen-minute work is a complex, four-movement affair of profound expression that might elicit many reactions. My interpretation of this work therefore is obviously subjective. Your take might be considerably different. To those who believe that good piano music ended with Prokofiev and Rachmaninov, this is evidence that it lives on. What makes the disc especially notable is the exceptional pianism of David Korevaar. He has already given us excellent discs of Chopin works and Hindemith sonatas, both for this same label. He has also recorded CDs of JS Bach works, Schubert sonatas and much chamber music. After listening to his interpretation of these Liebermann works, I can’t imagine significantly better performances. Moreover, I doubt whether you’ll get the chance to hear much competition in this repertory at any time in the near future. For Liebermann admirers then, this disc is probably essential; for those wanting to explore good contemporary piano music, here’s a fine prospect.